To really experience Alaska, it’s best to get out and explore it on foot. 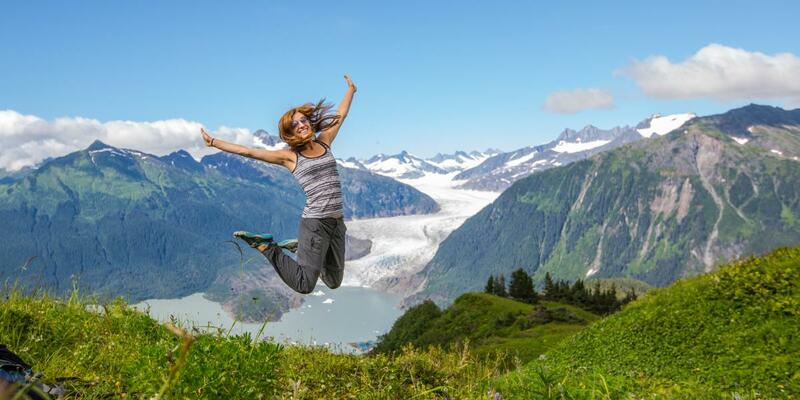 Juneau boasts more than 250 miles of hiking trails, so there are plenty of opportunities for hikers of all skill levels to get up close and personal with the area’s mountains, forests, meadows, and mining ruins. You’ll likely spot more wildlife than you can shake a field guide at it. Trails range from fairly flat wheelchair- and stroller-accessible nature walks to strenuous uphill treks. With such a varied selection, hiking in Juneau truly lets you choose your own adventure. Perseverance Trail (3 miles round-trip to Silverbow Basin, 2-4 hrs., considered easy to moderate) With a well-marked trailhead at the end of Basin Road, this is the most popular and easily accessed trail system in Juneau, following Gold Creek into the valley behind downtown. At scenic Silverbow Basin you’ll find the now-abandoned Perseverance Mine, which operated from 1885 to 1921. Be very careful if you explore the ruins. Perseverance Trail branches off to the more challenging Granite Creek Trail, (7 miles round-trip, 3-4 hrs., moderate to strenuous) and even steeper Mount Juneau Trail (12 miles round-trip, 10 hrs., very strenuous), which summits 3,576-foot Mount Juneau then continues along the ridge, eventually looping back to the valley floor. Views are stupendous, but the ridge loop is an expedition — plan and dress accordingly. Mount Roberts Trail (2 miles, 1.5 hrs. to the Mountain House; 4.5 miles, 4 hrs. to the summit; moderate) Another popular hike from a different trailhead on Basin Road, Mount Roberts Trail features a series of switchbacks up through boreal forest, providing increasingly good views and wildlife spotting. At 1,760 feet, hikers reach the tree line and the Mount Roberts Mountain House, upper station for the Goldbelt Mount Roberts Tramway. Spend $10 there and ride the tram back down for free. Or continue to the top — it’s actually a smoother gradient (and usually less muddy) than the first section. Looking for a shortcut to the ridge? You can also ride the tram up to the Mountain House and start hiking from there. East Glacier Loop Trail (3.5-mile loop; 2-3 hr; moderate) A good “leg-stretcher” that takes you up above the east side of Mendenhall Lake; good glacier views and possible black bear sightings. For a “bird’s eye” perspective on the glacier and a slightly more difficult hike, West Glacier Trail (7 miles round-trip; 4-6 hrs., strenuous) skirts the northwest side of Mendenhall Lake then climbs through forest to the bare rock along the glacier’s west side. It also provides access to ice caves, which, while spectacularly beautiful, are also spectacularly dangerous — if you choose to visit them, go with a professional guide. Shorter jaunts from the visitor center include several easy planked and/or paved trails, all between .25 and 1-mile. In addition to stunning views of the glacier’s face, these wheelchair- and stroller-accessible trails also feature spawning salmon streams and, during peak salmon runs, some of the best — and safest — bear viewing opportunities in Southeast Alaska. For the slightly more adventurous: Nugget Falls Trail (.8 miles long, 30 minutes, easy), a flat, well-developed trail to the foot of Nugget Falls. Look for mountain goats on surrounding cliffs and icebergs in the lake, which often resembles a floating frozen sculpture garden. Dan Moller Trail (6.5 miles round trip; 3-5 hrs., moderate) This trail gradually climbs high into an alpine cirque, with excellent views and great wildflowers. Parking lot and trailhead on Pioneer Street, in the neighborhood right across the bridge from downtown. The Dan Moller Trail intersects with the Treadwell Ditch Trail (16.5 miles end-to-end, easy), which transverses Douglas Island. Big trees, good footing, wild blueberries (in season) and recent upgrades make this a great, relatively flat walk through the woods along the old Treadwell Ditch, once the source of water and hydroelectricity for mines (and miners) on the island. Rainforest Trail (.8 mile one-way; 30-45 minutes, easy) Near the end of the North Douglas Highway, this wheelchair- and stroller-accessible trail cuts through lush rainforest (hence, its name) to a small beach with great views of Admiralty Island, Lynn Canal, and the Chilkat Mountains, plus the occasional sea lion and humpback whale. Airport Dike Trail (1.2 miles one-way, 1-2 hrs., easy) A wheelchair- and stroller-accessible trail through Mendenhall Wetlands State Game Refuge with outstanding bird watching. Paved and very well maintained, Airport Dike Trail is a local favorite for dog walkers, cyclists, joggers, and parents with young children. Kaxdigoowu Heen Dei (Mendenhall River Trail) (2 miles one-way; 1-2 hrs., easy) Starting at the Brotherhood Bridge off Glacier Highway, this trail follows the Mendenhall River greenbelt; a wildflower hot-spot with the glacier in the distance, this rates as one of the most Juneau’s most picturesque spots. Its Tlingit name means “going back clearwater trail,” fitting, as this wheelchair- and stroller-accessible trail accesses several fishing holes in Montana Creek. Expect non-motorized traffic, including bicycles and even horses.